USBC: key for storage the weights. Thanks to the USBC kit, you will be able to save all the weighs made during the work day, for a subsequent processing and saving on PC. 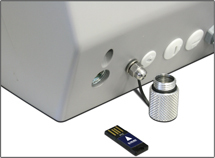 The kit is made up of a built-in USB port inside the indicator and a fitted USB key. The USB port is installed in the rear of the indicator, replacing the standard RS232 port and occupying a serial port of the weight indicator. During the weighing operations, the key is protected by a special aluminum screw cap, which also guarantees an IP65 protection. 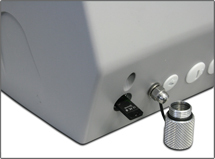 The kit is compatible with all the indicators of the 3590E and DFW ranges, both with the ABS case as well as the stainless steel case. 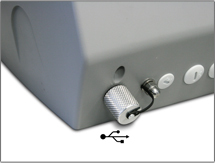 The data can be saved when a key is pressed, and, when combined with a 3590E, these can be saved automatically in a certain amount of time, in order to monitor the weight decreases. In combination with DFW indicators, it allows to store the same printed data, in the same format (in a .txt file). In combination with the 3590E indicators it is possible to completely customise the format and type of saved data, and optimize them for eventual compatibility with databases and programs, or for the simple processing with Excel. USBC Built-in USB port kit for data storing on USB key. Fitted with USB key for PC. USBEGT8 Built-in USB port kit for data storing on USB key. To be coupled with 3590EGT8 touch screen weight indicators. It does not occupy serial ports. Fitted with USB key for PC.